Jonno Ingerson, Head of Research, CoreLogic NZ Ltd. The latest QV house price index is out. Nationwide values have remained dead flat over the past three months, leaving the annual change at 11%. Previously, we’ve seen Reserve Bank lending restrictions resulting in a very brief flattening of nationwide values in early 2014 and again in early 2016. This time however, the slowdown has already lasted longer than we’ve experienced before. 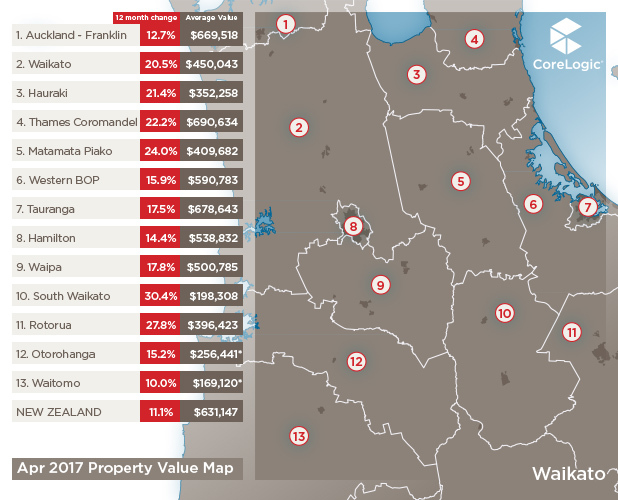 Much of that nationwide figure is driven by Auckland, where values are down 0.4% over the past three months. 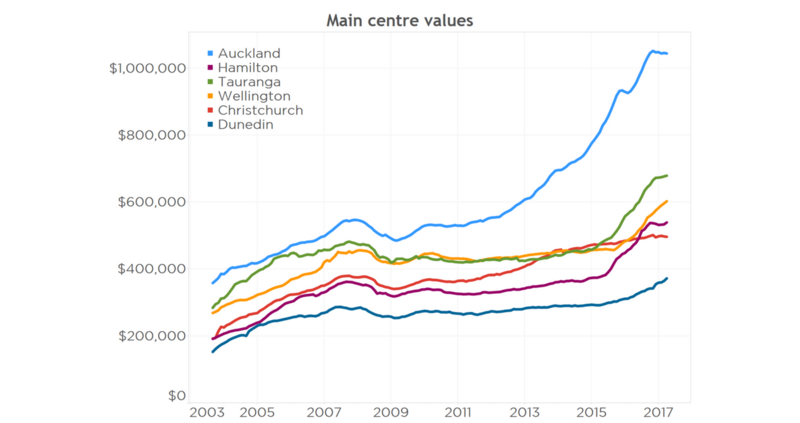 The chart below shows the change in average value of housing stock in each of the main centres. 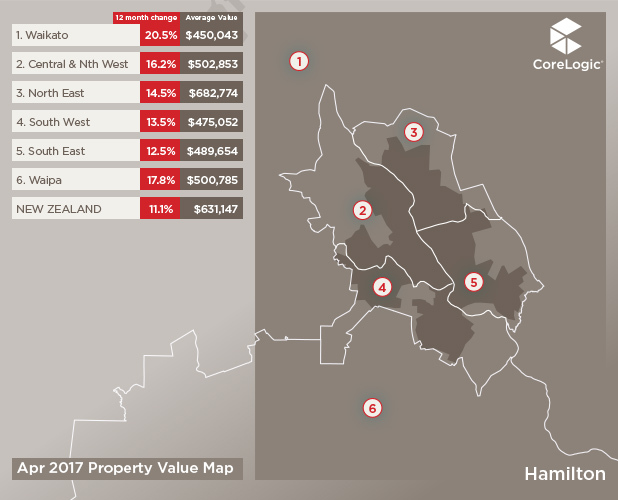 Auckland’s value drop over the past few months is clear, and the short-lived decline in Hamilton appears to have ended with a slight rebound in values. Tauranga’s rate of growth has slowed considerably, with the last few months being barely above flat. Wellington’s growth has slowed a little since the middle of last year, which you can see in the very slight change in slope of the Wellington line. It remains the fastest increasing of all the main centres with a shortage of both new housing and properties listed for sale keeping the upward pressure on prices. In Christchurch, values have also been very gradually decreasing since November 2016. That follows a couple of years of values increasing very gradually. Dunedin shows a slight wobble in late 2016, but in the last few months values have resumed their steady increase. Clearly, there are different patterns emerging across New Zealand, but the main theme is that previous rates of housing value growth have slowed considerably. Remember that in the middle of last year values were increasing strongly almost everywhere. The size of the bubbles on the map represents the number of sales over the past three months in that area (larger bubbles means more sales). The colour of each bubble represents the value change over the past three months. Blue means values have dropped more than 1%, grey depicts where values have been pretty much flat (at between -1% and +1%), light orange represents 1% to 3% growth, improving to dark orange (3% to 5%), and finally red for growth greater than 5%. The cluster of bubbles around Auckland corresponds to the old pre-Supercity Council areas (which many people still relate to). 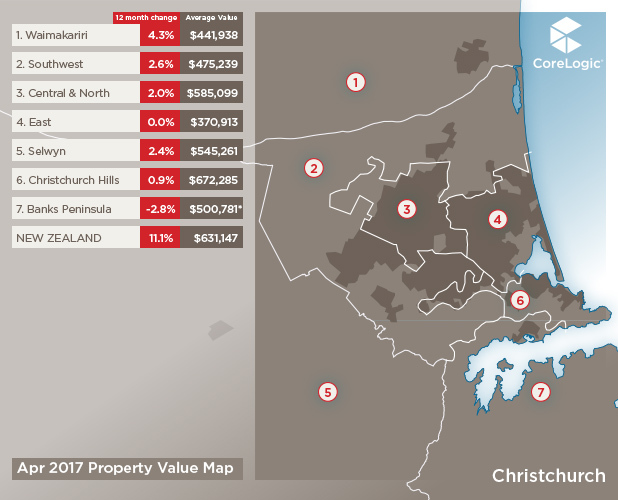 They show North Shore and Waitakere dropping slightly in value, whilst Auckland City and Manukau are flat. The fringe areas of Papakura and Rodney are still rising modestly. Tauranga is the other big grey bubble, along with Taranaki. They are the clearest examples of previous value growth slowing to near zero. 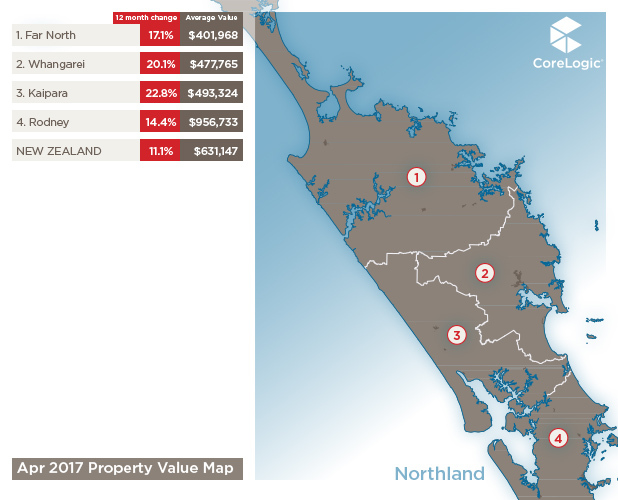 Much of the rest of the North Island still appears to be increasing strongly, although what this map doesn’t show is that many have slowed in the past three months. 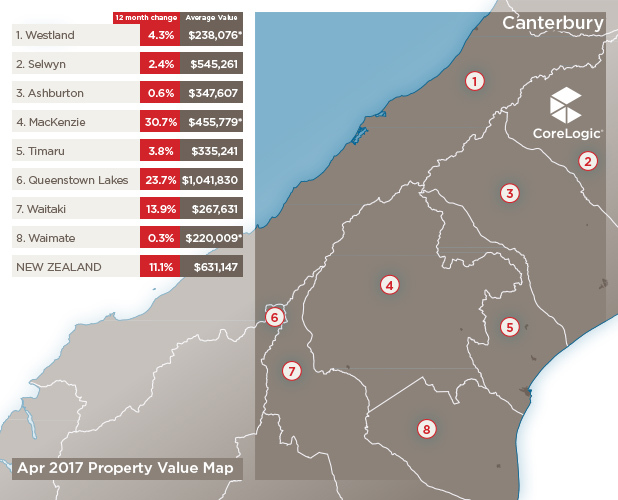 In the South Island, Canterbury stands out as a large area where values are more or less flat. This flattening also extends to Marlborough, Queenstown and Invercargill. Other larger South Island centres such as Nelson and Dunedin carry on climbing. 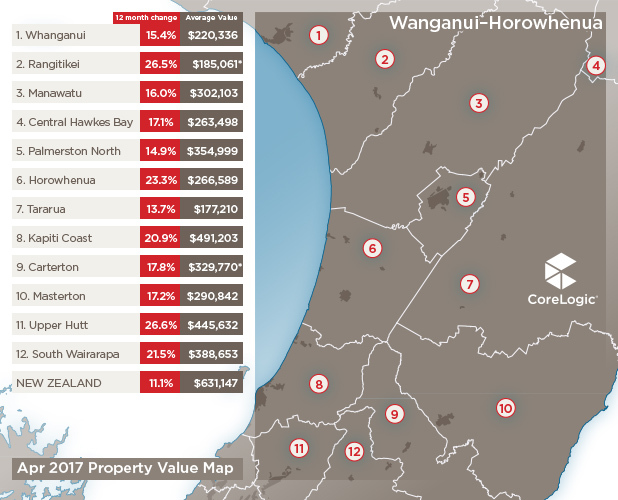 The table shows the top ten areas by percentage increase in value over the past three months. reversing the steady downward trend that began in 2008. The Opotiki District has one main town, Opotiki. Rangitikei has four main towns: Bulls, Marton, Hunterville and Taihape. All show the same upward trend in values. In both Rangitikei and Opotiki it is worth noting that despite increasing in value by 26% over the past year, they have only just made it back to the value they were at in 2007 before the Global Financial Crisis and subsequent recession. 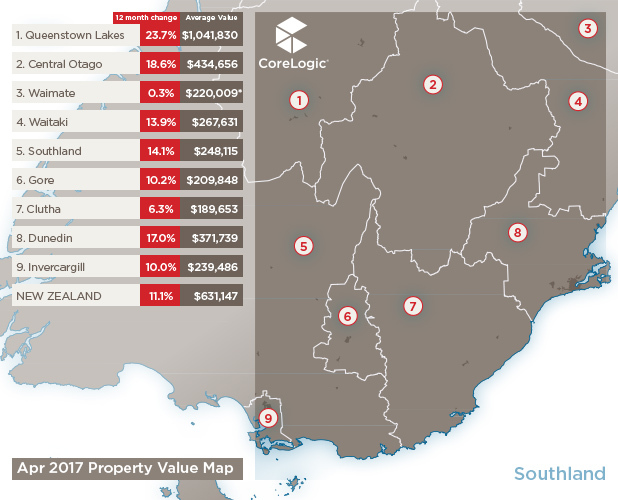 The increase in value over the past 18 months in these areas is in line with almost every part of New Zealand. New Zealand’s high net migration, fuelled in part by far fewer Kiwis going to Aussie from every town and city will be helping to fuel this value growth. So too will the loosening of the lending restrictions outside Auckland in late 2015, although they have now been tightened again. Record low interest rates are also in the mix, along with a desperate shortage of properties listed for sale. 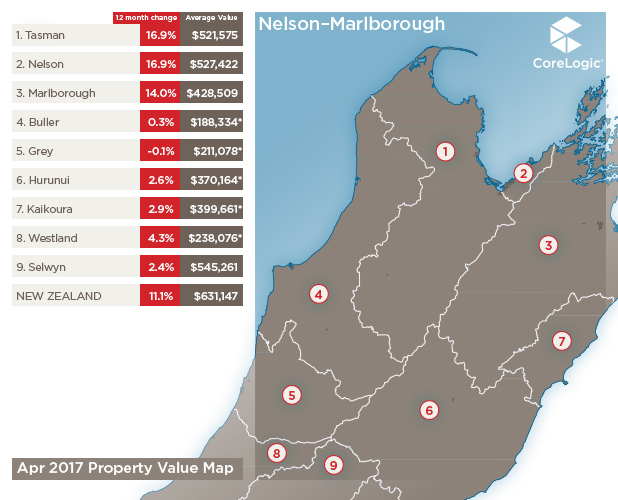 Mackenzie is number three on the list and is now a whopping 73% higher in value than it was in the 2007 peak. The main towns in Mackenzie are Fairlie and Twizel. Both towns were unusual in that values didn’t drop during the GFC, and Twizel in particular has thrived from the booming tourism sector. Coming in at number four is Tararua which has also now just clawed back to 2007 values. The four main towns of Dannevirke, Woodville, Pahiatua, and Eketahuna have all been increasing since mid to late 2015, with just a hint of slowing down in the last month or two. Numbers five and six, Thames-Coromandel and Kaipara respectively, both have the influence of Aucklanders and Auckland money helping keep the markets strong. 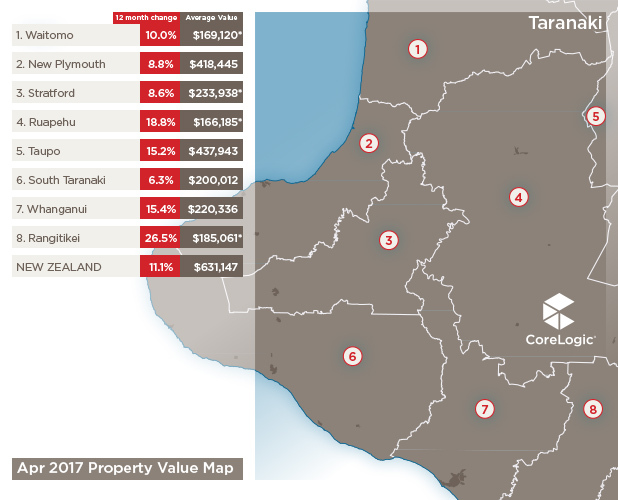 Neighbouring areas of Wanganui and Rangitikei (Raetihi, Ohakune, National Park and Taumarunui) are also areas that are only just approaching 2007 values. In Rangitikei there are the first signs that the rapid increases of late 2016 may be backing off this year, particularly in Raetihi. Central Otago at ninth place is increasing in value in large part due to an overflow from Queenstown where a shortage of housing means large numbers of workers in the tourism and services sector are living in the surrounding areas. Porirua at number ten on the list is benefitting from a bouyant Wellington area market. 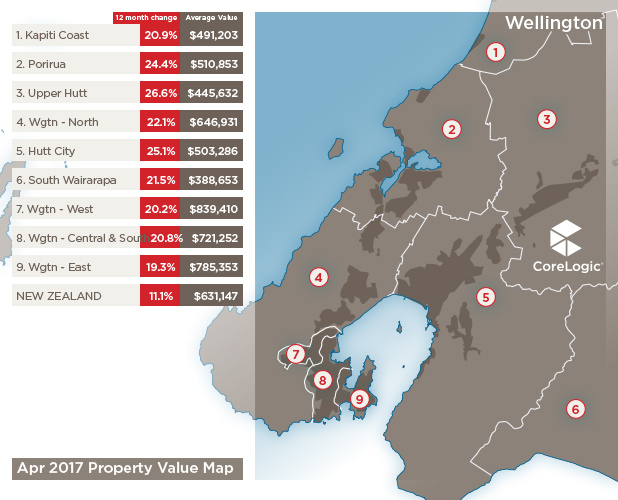 As values in central Wellington have climbed over the past couple of years, first home buyers in particular are now looking at more affordable fringe areas such as Porirua. 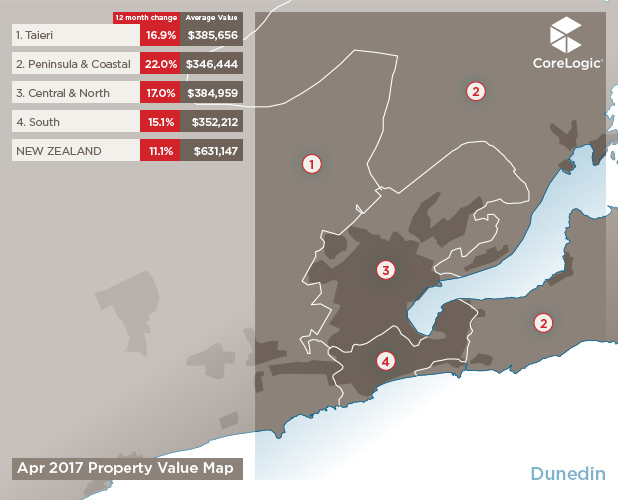 The three month increase in values is at a similar rate to the past year, showing that Porirua really hasn’t slowed at all in the past few months like other areas have. One of the characteristics shared by many parts of the country, especially outside Auckland, was a huge surge in sales activity during 2016. In many areas the number of sales was at or beyond those last seen in the previous boom of the market in 2005 to 2007. That surge in sales activity came at a time when new listings were weak, meaning that the total choice of properties for sale reduced further. This further worsened the high demand, low supply dynamic, pushing prices up. There has been a large drop in sales activity so far in 2017 compared to 2016. This is partly attributable to the latest round of Reserve Bank lending restrictions, but rising interest rates also play a role. While the Reserve Bank has kept the official cash rate at record low levels, fixed term mortgage interest rates have risen this year. This reflects the higher cost of money that the banks need to source offshore to fund their mortgage lending. The average two year fixed interest rate rose around half a percent in the first few months of 2017, and while this is not a huge increase, every little increase in interest rates means that borrowers can borrow less. This increase in fixed term interest rates is likely to continue. Another factor leading to less activity is that the big banks are now much stricter about the recipients and amounts of lending. In many cases they are going well beyond the expectation of the latest Reserve Bank lending limits. The banks are increasingly nervous about continuing value increases and are looking to reduce potential risk should there be a downturn, or a change in conditions that make it harder for borrowers to pay their mortgages. This drop in sales activity will likely mean that values will not increase as quickly as they did when there was more sales acitivity. 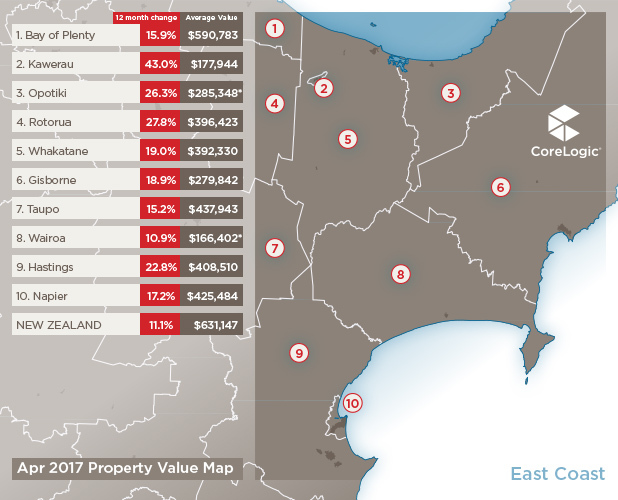 Our CoreLogic buyer demand measure, which predicts sales activity in the subsequent weeks, showed some very low weeks across the country in the lead up to the recent holiday periods of Easter and Anzac weekend. If that weakness carries on now that we are heading into winter, then we can expect sales activity to drop further. That should take more heat out of values, and I’m expecting that the usual recovery the property market enjoys in spring will be interrupted by the General Election. 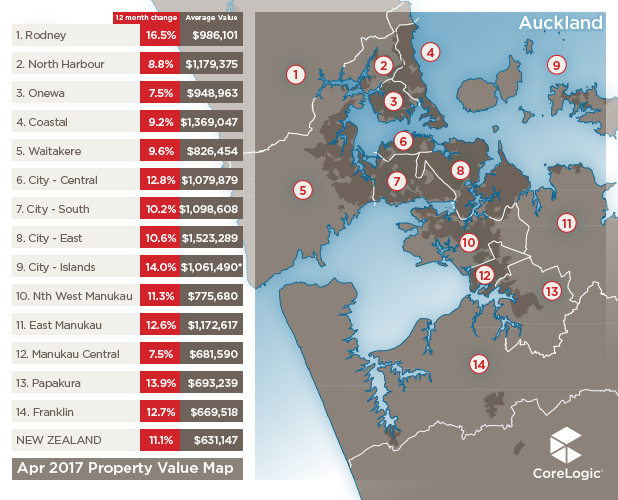 I still don’t believe that we are going to see a sustained drop in values in Auckland or elsewhere. The population is continuing to grow faster than we are able to build houses, and until that reverses one way or another then values are unlikely to crash. But the greater degree of slowdown in Auckland suggests that affordability may now be biting harder. If that is the case, then along with tighter and more expensive lending, a rebound in Auckland values next summer will be more muted than we have seen previously. 1/ The greater and overriding trend must be that a good part of the NZ economy and employment stats are being kept from recession by the government via unsustainable immigration driven activities. i.e. unproductive public roading infrastructure, and quasi-private bricks and mortar expenditure. The situation is feeding on itself with record levels of government debt at around $150 Billion (including military expenditure). These activities do not earn any overseas funds that benefit NZ. Relentless Immigration and its consequences simply drive up consequent infrastructure investment and housing demand and prices. Housing prices are surely set by supply and demand. There is also evidence that the government has a conflict of interest when it comes to the matter of rampant immigration as it is implicated in its cause. e.g sponsored employee immigration by government departments and corporations the government is a shareholder or part ownership in. Multinational corporations simply add to this. 2/The impotence of the NZ Reserve bank is perhaps simply a reflection of the escalating level of foreign investment going on in New Zealand by foreign investors. Only one NZ bank loans money from the NZ Reserve bank while other banks get loans from foreign sources. This includes investment by colonialist sovereign countries which are also outside of Reserve bank control. This illustrates that the Reserve bank of NZ is past its use-by date. New Zealand based investors buying Real Estate here cannot compete with overseas investors who pay 1% or less interest for the money they bring with them. This simply brings more buyers to the market and forces up prices only to have them fall when these overseas buyers leave the market for global financial reasons. Currently, some overseas investors have returned home for their summer and left the NZ market. Perhaps others are simply awaiting an NZ election outcome later this year. Everything else is just statistical noise. The chief factor seems to me to be the relentless immigration into NZ. While that continues, values must stay high. In my view the immigration settings are foolish and damaging. it is a shame that the good data is confused by very poor analysis. This concept that Auckland prices will continue to grow is plainly ridiculous and dangerous. There are people who cant afford to lose money investing on the basis of the comments without even a concession that there is a major risk of a downturn.